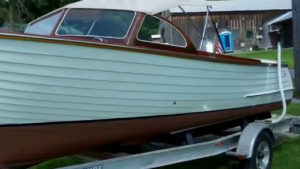 She is a 1955, 20′ Lyman Runabout, Hull #1028 that we are told was at one time used as a commercial fishing boat off the coast of Maine. 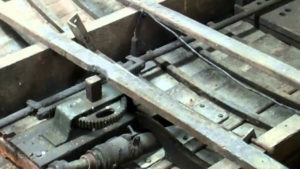 The intriguing aft steering mechanism supports that contention. If you have ever seen a steering unit like that detailed in this video, please let me know! 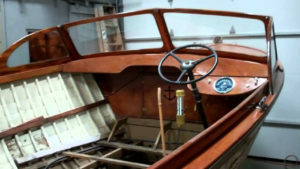 We have everything but whatever protruded through the floor and functioned as either a tiller or a steering wheel. She had been in Vermont for almost 20 years when we found her; at least 10 of which were spent sitting on a wood cradle crammed into a barn. 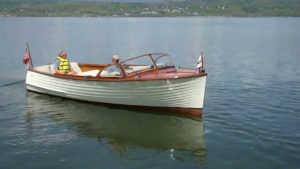 All of her hardware, lighting, gauge panel, running gear, rub rails, etc., save for the stern pole base, are original. The burgee is a modern replacement. The original “Lyman” hull tags are in excellent condition. 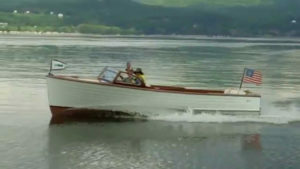 She is powered by her original Chrysler Crown M-47, flathead six engine that produces 115 HP. 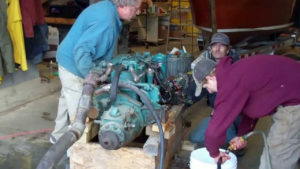 The engine has fewer than 2 hours since having been completely rebuilt by Vermont Engine Service LLC. In the process we replaced her transmission seals, fuel pump and water pump, and upgraded the engine to a Pertronix ignition. Her Zenith carburetor was rebuilt by NH-based Hobbs Carburetor. Her ceilings were released completely, stripped, stained and sealed with 3 coasts of CPES, before receiving 12 coats of Pettit Hi-build varnish. 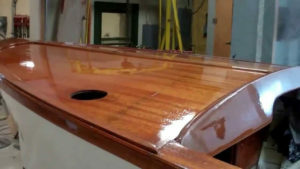 Her floor panels were released, stripped, sealed and the edges and bottoms sides received multiple coats of primer and Sandusky Lyman bilge paint. New Nautolex was installed as well. The upholstery could not be saved, so we had new cushions, engine-box-cover and seatbacks fabricated that match the original set exactly. Every rib was inspected and 11 were identified as failed and were either sistered or replaced completely. 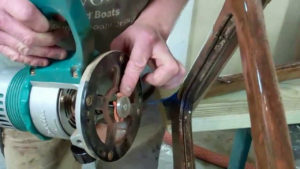 The bilge was degreased, cleaned and then received 3 coats of Lyman Sand Tan bilge paint. The steering and shift rods and their components were sand-blasted and then received 3 coats of black Por-15 paint. We found a small rotted section in one plank where the exhaust pipe passed through the transom. Rather than lose an original plank, we repaired the area using a Dutchman that I challenge you to find. 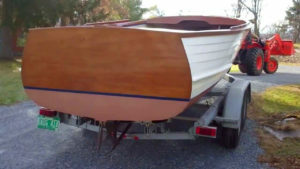 The four-plank, solid mahogany transom was stripped, sanded flat, stained with Sandusky Lyman Mahogany filler stain and sealed with 3 coats of CPES before 12 coats of Pettit Hi-Build varnish were applied. The decks and covering boards were sanded flat, stained sealed and received 8 coats of Pettit Hi-Build varnish with appropriate sanding executed between coats. The topsides and bottom were completely stripped to bare wood. Wherever indicated, strakes were refastened, and both the bottom and topsides were faired, before being sealed with CPES, primed and painted. 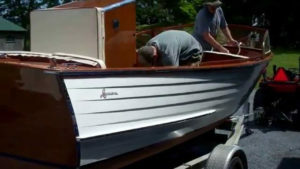 The bottom received 3 coats of Pettit Tie Coat Primer and 3 coats of Sandusky Lyman Tan antifouling paint. The topsides received 4 coats of Interlux PreKote primer, followed by 4 coats of white semi-gloss Interlux Premium Yacht Enamel, with appropriate sanding executed between coats. All of the hardware was sent out to chrome last spring. 1955 Lyman Utility C-1028 Please Strip the Old Paint First!!! 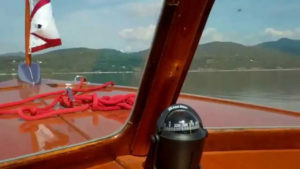 1955 20′ Lyman Runabout Windshield Back on Deck! 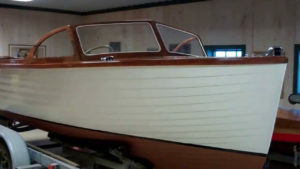 1955 20′ Lyman Runabout Preservation is 99% Complete! 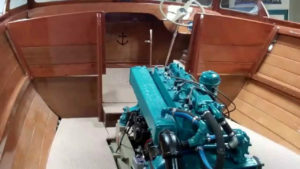 1955 20′ Lyman Runabout Chrysler Crown M 47 Roars!